Brokerages often limit the historical transactions that can be downloaded for your account. For example, some brokerages limit the transactions to only those that have occurred in the past 90 days. Some only allow 1 or 2 years of transactions to be downloaded, while others allow you to download all transactions that have occurred in your account since it was opened. Because the transactions downloaded from your brokerage may not be the complete transaction history of your account, those transactions may not cover all of your account’s current holdings. For example, if you purchased a stock 5 years ago, but your brokerage only provides the last 1 year of transactions, no purchase transaction for that stock would be downloaded. StockMarketEye makes every effort to reconcile the downloaded transactions with the downloaded current holdings, matching purchase transactions with currently held positions wherever possible. However, if the brokerage did not provide matching purchase transactions for a currently held position, StockMarketEye will create a “placeholder” transaction for consistency. For example, if the brokerage only provides 1 year of transactions, but one of your currently held stocks was purchased 5 years ago, StockMarketEye will create a placeholder purchase (BUY) transaction for it. Purchase Date is set to one day before the date of the first transaction that was downloaded. Purchase Price is set to 0. After import, you should modify the placeholder transactions to set the correct purchase date and purchase price. These fields are used to compute gains and losses, so having appropriate values will allow StockMarketEye to make correct calculations. 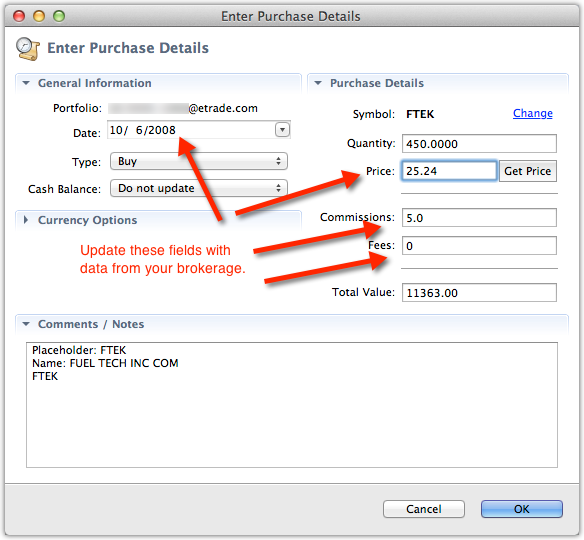 The following sections show how you can modify the placeholder transactions to set the purchase date and price to their appropriate values. Locate an item in your portfolio that is linked to a placeholder transaction. You can tell which items are linked to placeholder transactions because they will have a “Buy Price” value of 0. Select the item, then click on the “Details” button in the toolbar. The Enter Purchase Details window will open and you can see the details of the transaction. At your brokerage, locate the purchase date and purchase price of this holding. You may be able to find this on the broker’s website, or you may have to look in your past brokerage statements. If the holding was purchased all at once on one day (as a single lot), change the “Date” and “Price” fields in the Details window to match the data from your brokerage. If the holding was purchased on multiple days for multiple prices (as multiple lots), use the average purchase price of those shares in the “Price” field. For the “Date” field, you would typically use the date of the most recent purchase of that holding. You may also wish to set the “Commissions” and “Fees” fields, based on the information you find at your brokerage. Click on the window’s “OK” button to save the modified details. The data in the Prices view will be updated and the correct gain/loss will be shown. Open the Transactions Report and locate the placeholder transactions. The placeholder transactions will be the first ones in the list and have a “Price” column value of 0. Select the placeholder transaction, then click on the “More” menu at the far right of the StockMarketEye window and select the “Show transaction details...” item. The Enter Purchase Details window will open and you can see the details of the transaction. You can also change individual fields of a transaction, either in the “Prices” view or in the “Transactions” view, without opening the Enter Purchase Details window. 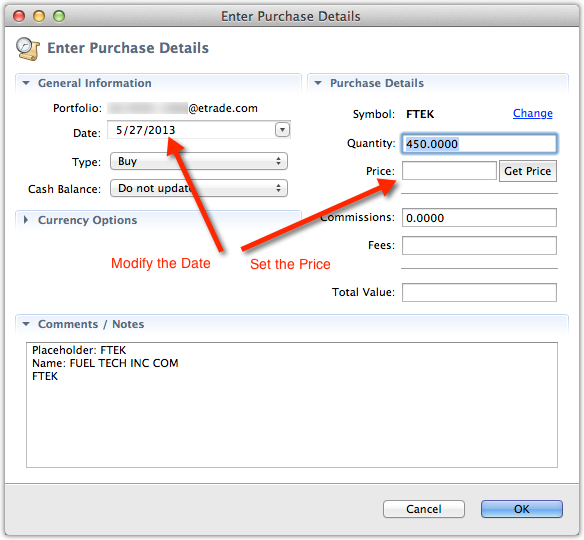 The following steps show an example of modifying the “Buy Price” in-line in the portfolio’s “Prices” view. Select the item you want to modify. Click in the “Buy Price” cell of that item. Enter the new purchase price and press return. The price is saved and gains/losses can be correctly calculated. Note: The purchase date can only be changed from within the Enter Purchase Details window.